Van Gogh’s Pens – Pens! Paper! Pencils! According to the Van Gogh Museum in Amsterdam, Van Gogh is the world’s favourite artist. Mind you, they would say that. He is definitely one of my favourites, though, despite my contrary nature. To me, he paints like a child would paint if that child had the experience of an adult and the results are beautiful and moving. I was lucky enough to visit the aforementioned museum last week and enjoyed every moment of of it. I learned that Van Gogh practised and practised and practised. The paintings that look so much like the artistic representation of a stream of consciousness were carefully planned and considered and the result of years of study. Isn’t this always the case? The amount of effort needed to make something look effortless is always beyond what most of us are prepared to do. While wandering through the museum I came across this little display, which provides the, I admit rather tenuous, excuse to write about Van Gogh here. 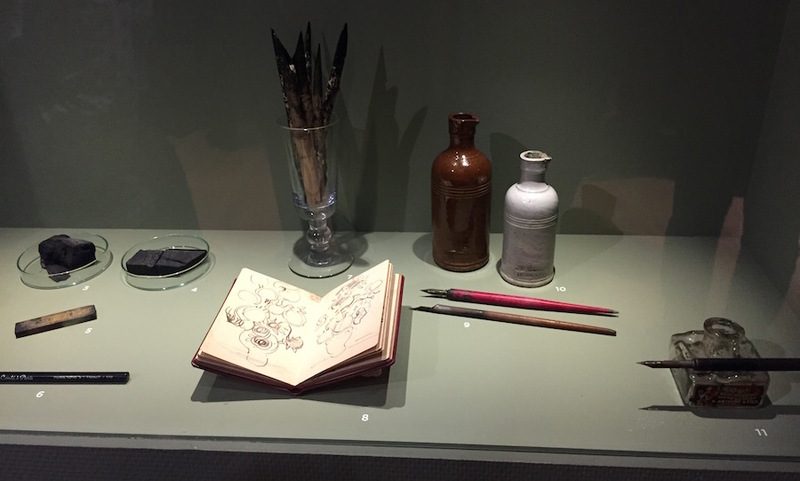 These are some of his dip and reed pens, along with a little sketchbook, an ink pot, some charcoal and a pencil. In the sketchbook you can see some sketches Van Gogh made of his famous sunflowers. Some further reading: here Stephen Brown shows us how to pronounce Van Gogh properly; and here Maria Popova shows us some more pages from his sketchbooks.